So here’s my latest report. Which boils down to “nothing to report.” Except that the water temperature on the central coast this Sunday afternoon was pleasantly warm. As for the sea level, which is supposed to be rising because of climate change or global warming? Well, as usual, you cant see it. Anyway, I can’t. Hard to imagine an ocean calmer than this off Yachats on Sunday. If you lived on the East Coast, you could see the effects of the rising sea levels. I’m surprised that you are so blase about global warming. You are a smart man, but certainly stubborn about things you don’t want to believe in. 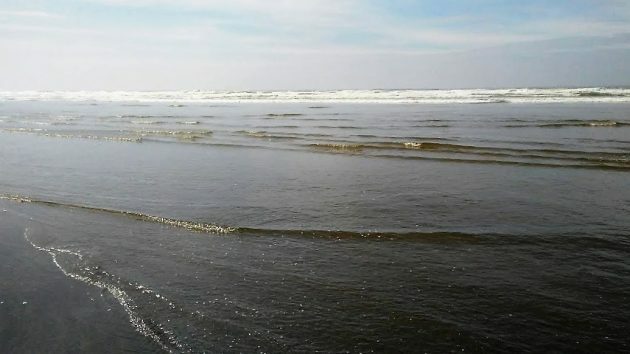 There are already eroded beaches on the Oregon Coast from the unusually high tides with storms in the winters. More violent storms are part of global climate change. A friend of mine drove me by Agate Beach near Newport last summer to show me the drastic changes there from the storms. No more long beach to walk and find agates on. Mainly just big sand dunes now at Agate Beach. Thanks to Hering’s in-depth study of this issue, I will sleep better tonight. Yachats? You’re in the wrong place. Warrenton is where the action will be in 2100. Eighty two years from now over 800 houses in Warrenton will be underwater due to global warming. At least that is what the ‘scientists’ and real estate experts tell us. Meanwhile, Maersk is testing a high-latitude shipping route via the former polar icecap. You might want to get a better ruler, as it has gone up a couple mm since the last time you checked. What? You haven’t noticed that the sea level rose by 3.2 millimeters since last year? I hope you know how to swim if you go back there again next year. Hasso, seriously? Is the time to worry about the much more common and fierce wildfires when they’re burning your house down? Don’t be hatin’. I’m with Hasso on this. Despite what Globalists would have us believe climate change is far from settled science and a number of climate scientists have been proved to be gaming the system which is to be expected anytime grant money and politics is involved. Now go ahead and call me names if it makes you feel better but my opinion absolutely does not make me into a climate denier. It is good to retain healthy scepticism and not goose step in sync to unproven claims. Does the climate change? Yes. Is it an emergency? Unproven claims abound. I intend to remain open to facts. Until it’s been established how high the ocean is supposed to be, one doesn’t know if it’s simply getting back to “normal”.